If you are interested in speaking opportunities, please contact Ellen Wheable at ellen.wheable@forum-europe.com or on +44 (0) 2920 783 025. Session 1: IoT and the DSM: Will a European single market for IoT be achieved? What to expect post-2019? A key ambition of the Digital Single Market strategy is to create and support an appropriate environment for the successful rollout of IoT in Europe. A year before the end of the mandate of the current Commission, this session will be the opportunity to look at what has been achieved through initiatives (including the creation of AIOTI, the Digitising European Industry initiative and the European Data Economy Communication) analyse the state-of-play of IoT in Europe and crucially will explore what remains to be done to boost the take-up of IoT, unleash its potential and create a Single Market for IoT- allowing Europe to become a global leader in its development. This session will serve as an introduction to the rest of the conference. - What are Europe’s next policy objectives for The Internet of Things and what can be done to ensure the EU takes the lead in IoT innovation and adoption? - What existing barriers still prevent the take-up of IoT in the context of the DSM and is new legislation specific to IoT needed to address these challenges? - What have the different approaches and collaborative efforts in establishing standards for the billions of devices making up the Internet of Things achieved? What further efforts are needed? - What remains to be done to ensure that data sharing is promoted to support European innovators, allowing them to create new partnerships, reach out to new customers, and establish scalable business models? -What can Europe learn from the development of IoT in other regions of the world? For Europe to fully leverage the potential of the Internet of Things and to further encourage consumer adoption, the creation of an environment of trust and confidence in consumer-focused IoT systems, and the protection of the data that they generate is undoubtedly essential. The issues regarding data privacy and IoT have been thoroughly explored for a number of years and while policymakers, businesses and consumers are increasingly realizing the potential socio-economic benefits of IoT-generated data, a number of concerns still impede the widespread adoption of connected solutions. This session will examine the main privacy risks linked to IoT and discuss the current efforts undertaken to address these, whilst also exploring the additional work needed. It will identify how policymakers and industry actors can build an IoT privacy framework that both maximizes value and builds trust and confidence. The issues around data sharing and the challenges in defining data control in the realm of consumer-focused IoT will also be addressed. In addition, participants will explore ways to empower users and help them become ‘Smart Consumer’ so that they remain aware and educated about the evolving risks, keep questioning their own perception of privacy, and have full control over their data. Ultimately it will focus on the collective responsibility of all involved to ensure a coherent approach regarding trust and confidence in IoT solutions. - What are the main IoT-related privacy risks that businesses have to address and what practical solutions are available to add tighter privacy controls and manage risk effectively? - Are the privacy principles in Europe fit for purpose when it comes to IoT devices? How can it be ensured that regulatory frameworks around IoT-generated data keep up with future technological innovations? - What privacy engineering opportunities exist for apps, software and IoT systems developers? - How can users be reassured that they are not threatened, but empowered by IoT? How can an individual’s control over the use of their personal data be enhanced? Does the answer lie in concepts such as IoT Trust Marks? Will this be enough to drive wider IoT devices adoption? - How can regulators and IoT developers keep addressing the dynamic needs of consumers as well as responding to the ‘privacy paradox’ where consumers demands for data privacy is not reflected in their behaviours? How can it be ensured that consumers become Smart Consumer making informed decisions by remaining aware of the permanent balancing act between IoT benefits and risks? - How does the current thinking with regards to the definition of data control in the realm of IoT fit with current data protection and privacy regulation? Session 3: Is cyber Security keeping up with IoT developments? Despite an increased focus on cyber security, the number of cyber incidents is growing, and IoT vulnerabilities, in particular, are on the rise. In the last 18 month, several DDoS attacks of unprecedented scale affecting networks linked to IoT products - including the Wanna Cry, NotPetya and KRACK attacks - have highlighted how damaging an unsecure network and poor security hygiene of connected devices can be. As companies focus and spend more on security, cyber criminals are stepping up their efforts. The continued proliferation of interconnected devices are enlarging the ‘attack surface’, making IoT systems attack targets and creating the risk of criminals ‘weaponising’ insecure IoT devices. Participants in this session will explore the evolving security requirements that are specific to IoT and the technologies that can help meet these requirements. They will also debate whether the broader IoT community is acting quickly enough to tackle advanced persistent threats (APTs) directed at IoT devices and the infrastructure. In addition, they will discuss whether the current cyber security regulatory framework for IoT is fit for purpose, and explore progress made in relation to cyber security standardisation initiatives and IoT products certification and labelling. Finally it will focus on the responsibility of all stakeholders in the supply chain to develop a trusted IoT ecosystem that remain appropriate and proportionate to each potential risk – raising crucial questions about liability. - What specific security challenges are posed by IoT connected devices and how can existing security solutions be adapted and effectively used to respond to these? How can it be ensured that security awareness keeps up with the pace of innovation? - What role can IoT technology itself and AI play in helping to tackle security threats and what additional support does the European cyber security industry need to keep developing cutting edge IoT security solutions? - To what extent do current regulations around cyber security address IoT risks and is this sufficient to deal with the specific challenges that IoT raises? - Taking into account the number of actors in the IoT value chain what is being done to address issues related to the vulnerability of a complex supply chain? What measures to clarify liability around IoT security are being proposed? - How can the harmonization of IoT security strategies, standards, IoT products certification and labelling initiatives be further promoted in Europe and with global partners? A successful IoT ecosystem needs to be underpinned by a fast, reliable and ubiquitous communications network. To deliver this will require a mixture of different technologies and spectrum bands - there is no single, fit-for-all-purposes connectivity solution. And for the potential of IoT to be truly realised, there is also a need for regulators to work together and take a co-ordinated approach – the harmonisation of spectrum at a European and global level is seen by the tech sector as one of the key factors in driving the rollout of IoT services. This session will look at the different solutions and technologies that will play a part in meeting the connectivity requirements of IoT devices and use cases both today and tomorrow. With 5G set to be right at the centre of this mix in the long term, it will look at the potential that 5G technologies offer for IoT developers and stakeholders, and at how these and other connectivity solutions will power the IoT ecosystem going foward. And with wide-scale 5G roll-out still some time away, it will also look at solutions that are being put forward in the meantime to meet today’s immediate demand for low-power, wide-area connectivity. It will also look at the work that is being done to deliver an EU and globally harmonised approach to spectrum allocation for IoT, and at the bands that are being considered to deliver the required connectivity in both high and low frequencies. With the 915-921MHz band being put forward by some as a potential globally harmonised IoT band, it will discuss the feasibility of this and at the obstacles that would need to be overcome in order to deliver this. - What spectrum and connectivity options currently support IoT development in Europe and how are these technologies expected to evolve in the future? - What is expected to be the right technology mix to deliver a fast, resilient and reliable infrastructure for IoT in both the short term and long term? - What makes 5G particularly appealing for IoT and how can IoT stakeholders prepare for the 5G world? To what extent will 5G meet the promise that many are suggesting of being the true ‘enabling technology’ for IoT? - What options are available to meet today’s immediate demand for low-power, wide-area IoT connectivity and how can it be ensured that the connectivity requirements are delivered prior to the widespread roll-out of 5G networks? - How Important is it that a harmonised approach to spectrum allocation for IoT is achieved at a European and Global level, and what benefits would this bring? What work is being done to achieve this? - How realistic is a globally harmonised IoT band, and what potential does the 915-921MHz band offer to provide this? Are there other band options that could also be considered? What benefits would this bring, and what challenges need to be overcome for it to be achieved? This speech and discussion will serve as an introduction to the day and explore the role of IoT as a value-generator enabling the sustainable creation of new business models. Indeed, in order to generate more value and remain competitive, companies have to implement more creative and innovative ways of working together. This creates opportunities for start-ups and innovative organisations with expertise in capturing, managing and exploiting information to enter new sectors. Given the existing healthcare priorities in Europe and evolving demands of patients in different geographical areas and demographics, this session will explore the potential for IoT to deliver the digital transformation of healthcare systems that will revolutionise the sector, and alter the mindset of patients and of medical professionals. - How is IoT being harnessed by the healthcare sector in Europe? - What role are wearables devices and smart clothes playing in empowering individuals by motivating them to adopt and sustain positive lifestyles through personalized analysis of their data? What other health-related IoT technologies have emerged and how are these helping to address the urgent need for affordable, accessible care? - How is the use of IoT technologies impacting the way in which all players of the supply chain in the health sector operate? What new operating models are emerging? -What is the latest thinking around liability and ethics in relation to IoT-generated health data? - What progress is being made to ensure security, service continuity, interoperability and standardisation globally across different healthcare IoT applications? More and more businesses involved in traditional industries are now starting to realise the full potential of the Internet of Things in Europe, having implemented IIoT strategies to prepare for tomorrow’s industrial landscape. By connecting the physical world with the digital world, the IIoT disrupts traditional value chains and is enabling organizations to improve products, services and operations, to reduce cost as well as to deliver new business models. It has led manufacturers across all sectors to rethink the way they do things. 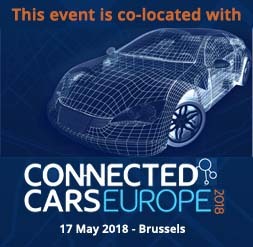 This session will explore what the state of play of IIoT is to date, will examine the adequacy of the current architecture and platforms in place for the digitisation of the European industry and will discuss the additional work that needs to be done by all stakeholders in order to fully maximize its potential. - What progress has been made with regards to the development of smart factories in Europe? How is the Industrial Internet of Things changing the competitive landscape of industries? How do innovative manufacturing companies use IoT technologies to fuel innovation and find value in unexpected areas? - Are the current architecture and digital platforms in place adequate for the digitisation of the European industry? - What role do policymakers have to play to create the appropriate environment for IIoT to thrive, and ensure that the European industrial sector - a key pillar of the European economy –remains a world leader in this area? - What technologies provide the foundations for smart manufacturing? How crucial will the roles of 5G, IIoT Gateways, common connectivity standards and Edge Computing be for the digital transformation of the European Industry? - Is there a need to review European legislations to address issues related to data ownership, liability or safety in the context of IIoT? - Is the European data infrastructure currently fit-for-purpose to enhance the capacity of AI in boosting the value created by IoT deployments? A series of case studies, talk and interviews of innovative companies, presenting how their solutions have disrupted specific sectors. Developments in machine learning and AI are rapidly enabling faster analysis of the data captured from the myriad of connected IoT devices and sensors. It is widely believed by industry experts that the true potential of IoT will be realised when combined with AI and Cloud Computing to form a single smart ecosystem. This session will discuss how AI will be key to unlock IoT’s potential, by identifying patterns and developing new algorithms that can be used to solve real-world, real people's problems. - To what extent is Artificial Intelligence helping the IoT grow? - How are EU lawmakers currently approaching AI and what we can expect over the next few years from a regulatory perspective, as the deployment of AI and its combination with IoT increase? - Is the European data infrastructure currently fit-for-purpose to enhance the capacity of AI in boosting the value created by IoT solutions? - To what extent does cloud-based Analytics-as-a-service optimize the value of IoT-generated data and create competitive advantages? - What tools are available to businesses to strategically prepare their organizations and be ready with the necessary expertise, application and data center investments to using AI? - What role do the big players in the tech industry have to play in making sure that the use of IoT and AI is responsible and remains ethical? - What benefits will the AI-powered IoT bring to consumers? What will be necessary for consumers to reap the promised benefits?